Shop & Post Office – Clachan in Kintyre, Argyll, Scotland. 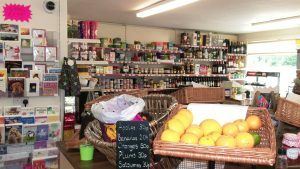 The shop is well stocked with groceries, household goods, veg and fruit, confectionary, wines and spirits, ice creams, newspapers, magazines and cards. Outside there is gas, coal and logs, and of course diesel and petrol. Chris, Paul, Leslie and Katie will help if you cannot find what you need. To return to the Home page click on the main title above.